So you're thinking of hiring a professional Christmas light installer to put up your Christmas light display this year? That's not a bad idea. In fact, it's a very good idea. Every holiday season there's a frightful rash of injuries, trips to the ER — and even the occasional death — as homeowners perform light installation chores that are very unfamiliar to them. Some Christmas Enthusiasts absolutely revel in the task of installing their Christmas lights. It's not dangerous drudge work to them; they love it! If that's you, this blog post might not interest you much (but we've got plenty of how-to help to offer you). But if the thought of installing this year's Christmas light display elicits from you a feeling more like dread than excitement, read on. 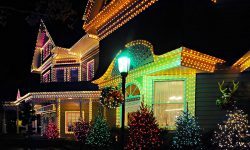 For you, hiring a professional to install your light display is an excellent idea. 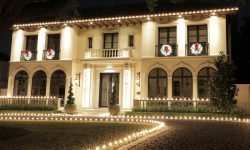 But just as do-it-yourselfer Christmas Enthusiasts need to know the proper techniques for designing and installing Christmas light displays, you need to know a few things about selecting and hiring a professional light installer. Now that the DIY guys are gone, the rest of us can have a talk. If you answered “No” or “I just want somebody to get this display up and lit,” when reading the above questions, this is the article for you! 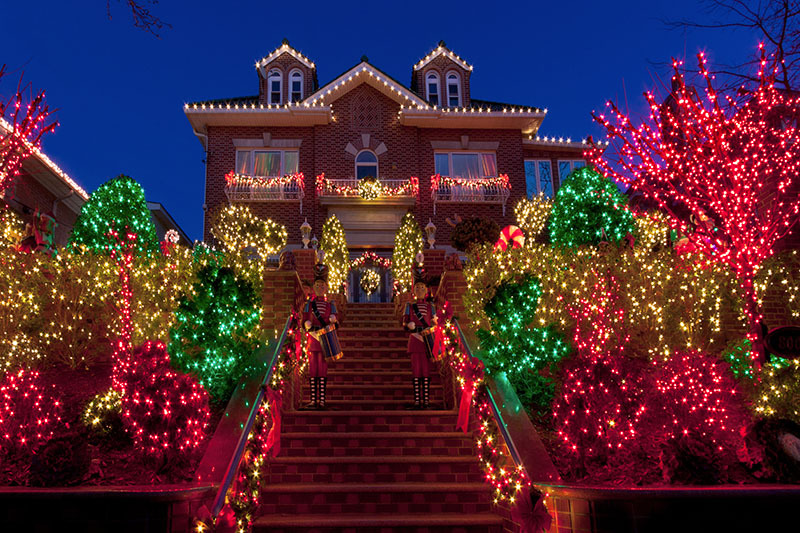 If you have grand plans for a Christmas lights display but no knowledge of how such displays are safely installed and powered, we highly recommend hiring a professional Christmas lights installer. 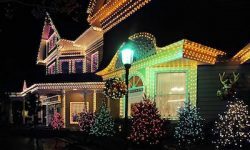 Every year, more than a few emergency room doctors find themselves dealing with injuries to poorly-prepared homeowners who attempt to install their own Christmas light displays (there is even the occasional death involved in such situations). Hiring a pro installer is a safe and efficient way to get a home or business decorated for the holidays. But just as it’s important for a dedicated do-it-yourselfer to learn the details about how to install a Christmas lights display, someone seeking to hire a pro-installer needs to know enough about it all to make a smart choice on which installer to use. 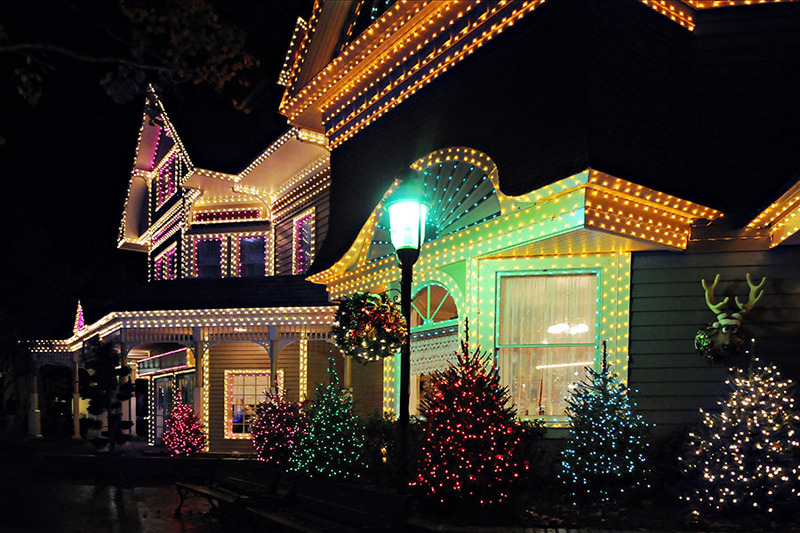 If you’re considering a Christmas lights display, ask yourself these questions first. Are you a Christmas Enthusiast who loves knowing all the details about what makes a great Christmas light display? Are you someone who has learned what professional installers do and feels confident about designing and installing your own display? Are you the type of person who enjoys a lot of detail work that other people might consider drudgery and that mostly goes unseen beneath a finished project? If you answered “Yes” to those questions, if you’re someone with a track record of mastering the finer points of involved DIY projects, why are you still reading? You’ve got a Christmas light display to work on! You may even want to check out our book, Starting Your Own Christmas Lighting & Decorating Business (it’s a great resource for do-it-yourselfers). Low bids can signal low quality. Is there an older truism than the ancient: You get what you pay for? Probably not. And it applies to everything. We always advise Christmas Enthusiasts to avoid cheap Christmas lights, because if you buy cheap, you get cheap. The same is true of professional installers.The cheapest installers are cheap for a reason — probably multiple reasons. Hire cheap, and you'll likely get someone with little design experience and little installation experience. As a bonus, you might have to deal with some reliability issues. There are people out there who figure the only qualification for being a Christmas light installer is the ownership of an extension ladder. Given the exceptionally low overhead involved with an extension ladder, such an installer tends to work pretty cheaply.Please, avoid hiring anyone whose prices sound just too good to be true. Odds are they don’t have a whole lot of experience, don’t put a lot of design thought into their work and—this one is big—don’t have the basic understanding of electricity necessary to do the job safely. Cut-rate installers can also be less than reliable because they’re offering this service as something they do on the side, rather than as a regular business with a reputation to protect. If a cut-rate guy says he’ll be at your house on Saturday, but lends his extension ladder to his brother-in-law on Friday, you could be out of luck. Installing Christmas lights can be a risky proposition — that's probably a large part of the reason you're not all that keen on doing the job yourself. There's certainly a potential risk to life and limb, but there's a risk to property, too. It's not something that warrants lots of worry; just make certain that the professional you hire is adequately insured — just in case. After all, that's what insurance is for. Since it involves both tall ladders and electricity, Christmas light installation comes with some inherent risks; in fact, those risks may be the very reason why you don’t want to do the installation yourself. Don’t be shy about asking if the installer you’re considering is insured and the extent of the insurance he carries. It’s not an insulting question; it’s a question that shows you’re a careful consumer who wants to know that anyone working on your property can count on the protection of insurance, should injury to themselves, or damage to your home, occur while they’re working on your project. Find out where they buy their lights — that will give you a HUGE clue about the quality of lights you'll be getting. They don't have to buy from us (though that will ensure top-quality lights). But you DO want to be sure they're buying from a dedicated, year-round Christmas light supplier. If you happen to run into your installer in the parking lot of your local big-box retail outlet, and you see him loading up his truck or van with boxes of Christmas lights, consider canceling your appointment with him. Professional grade lights are not what you find at retail stores, and any installer using them is tipping his hand about just how much experience and knowledge he has about the job he says he can do. om. Seriously, we deal in only top-quality material. Buy your lights yourself from a specialty retailer like Christmas Designers, and you'll be certain that your lights are of great quality. But it still wouldn't hurt to ask the professional installer where he buys his lights for other customers; the answer will provide a great clue about his professionalism. Is the professional installer asking you to pay more than half of the fee upfront? Politely decline, and look for another pro to install your Christmas lights. Paying a portion of the installer's fee upfront is common, but that upfront payment should NEVER be more than half of the total fee. If the installer is asking for more upfront, that's a red flag that should warn you away. For example, if an installer can’t afford to start work on your project without a large deposit, that could mean an unstable business. And, to put it in a slightly more cynical light, if all that upfront money is followed by delays and poor service, a less-than-reputable installer may count on your unwillingness to cancel the job and pursue a refund, while stringing you along about a completion date. You're asked for references if you apply for a job, right? Why should it be any different for professional installers that want you to hire them? Anybody that's been in the business for a while and has lots of happy customers — exactly the type of person you want to hire — will be perfectly happy to provide you with plenty of references. So ask how long they've been in business AND ask for references. Make sure your installer has installed successfully for other people. Also, find out how long your installer has been in business and ask for as many references as he can give you. No matter the depth of experience and the breadth of professionalism an installer offers, it's still possible that there will be some post-installation problems. Maybe some lights will go out before the holiday season comes to a conclusion. Or maybe you'll have some disagreements with the installation crew. No professional can provide a guarantee that problems won't occur. What they CAN do, though, is to have a clear and ironclad policy for resolving problems and issues. Ask about that. And in particular, make sure that they won't charge you unreasonably for coming back and addressing problems that crop up after the installation crew has left. 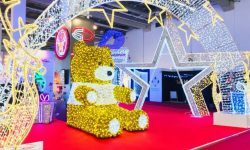 Even the most competent professional Christmas lights installers can be somewhat lax when it comes to laying out a complete business model that covers every step in the customer experience, especially where it concerns how to handle any problems that might arise. Suppose you don’t like the way an installation crew is behaving or treating your property? What if the crew isn’t installing to the specifications you agreed on when hiring the company? What’s the procedure for replacing lights that go out in the middle of the season? Before you sign on the dotted line, make sure your installer has a stated policy on dealing with customer issues. That includes making sure you won’t be charged an unreasonable fee if a crew has to return to your home or business in order to replace burned out lights or troubleshoot a malfunction. Unexpected problems are a fact of life, so don’t expect an installer to guarantee that nothing can go wrong; just make sure you have a guarantee of fair treatment and have your issues dealt with within a reasonable amount of time. Quite obviously, professional Christmas light installation is a seasonal business. So the people you'll be considering hiring will most likely do other forms of work during the remainder of the year. That's OK. But what's NOT OK is if the person you're considering hiring is sort of a hobbyist professional: a one-man operation installing lights out of the back of his pickup to snag a bit of extra Christmas cash. Go with a professional operation that's established, and that has the manpower to handle your job on a timely basis and respond rapidly to any problems or issues that arise. Sure, your installer will most likely do different types of work during the not-Christmas time of year. Just make sure you’re not hiring someone who (largely because he owns the aforementioned extension ladder or can borrow one from his brother-in-law) jumps into the business every season for some quick cash. It’s not your job to fund someone’s Christmas shopping. A reputable, professional Christmas lights installer will NOT be a one-man band. He will have a team that, while they most likely do other types of work the rest of the year, know what they’re doing with Christmas lights. And he will have enough people on that team to provide qualified installation and maintenance service throughout the season. Whether you install your own Christmas lights or hire a professional installer to do the job, a bit of planning will be involved. If you're doing the installation, you'll need to decide the type of lights you'll need and how many. You'll need to design your display. And you'll need to order your lights and supplies early to be sure that everything is on hand when needed. Whatever you do, don’t delay. And if you're hiring the job done, your planning will involve doing your due diligence in selecting the company that will perform your installation. It will also include contacting them and getting your service scheduled on a timely basis — in other words: EARLY. Qualified do-it-yourselfer? (Honestly, why are you still reading?) Get your design done and order all the lights you need, along with any other supplies, so you’ll have everything on hand and ready to go when you have a window of time to install your display. 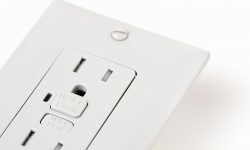 Hiring a pro-installer? Do your research and get on the calendar with a reputable installer as soon as possible. The best installers have a lot of repeat customers, so calling early gives you your best shot at getting your display up when you want it up. But once you've done that initial bit of planning and have your installation service scheduled, you'll be able to just kick back, relax, and enjoy the holiday season — and your beautiful lights. 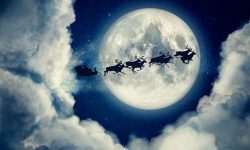 For lots of Christmas Enthusiasts, that's the best way to sail into the holiday season. However you get that display up and running, here’s wishing you a wonderful time enjoying it!